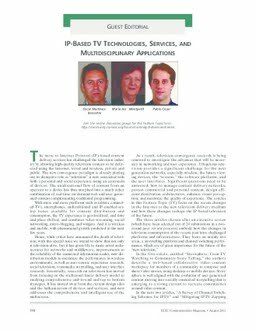 The move to Internet Protocol (IP)-based content delivery services has challenged the television industry by allowing high-quality television content to be delivered using the Internet, wired and wireless, private and public. The new convergence paradigm is already playing out its disruptive role as television is now associated with both a personal and social experience using an ecosystem of devices. The unidirectional flow of content from an operator to a device has thus morphed into a much richer combination of real-time on-demand web and user generated content complementing traditional programming. Bonastre, O.M, Montpetit, M.J, & Cesar Garcia, P.S. (2013). IP-Based TV Technologies, Services and Multidisciplinary Applications. IEEE Communications Magazine, 51(8).